Marv missed the old style food and service, No one wants to eat burgers that were cooked an hour ago or drink shakes that look like someone put food coloring in a pint of milk. So Marvs Drive In was born. 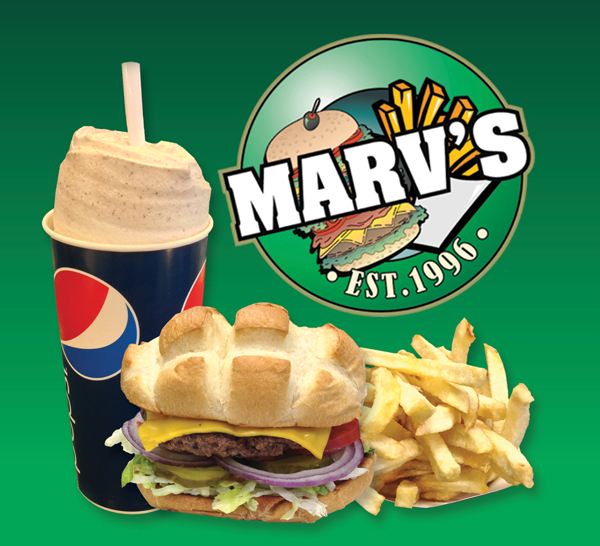 Marvs is the home of the freshly ground burgers and fresh cut french fries. We fresh cook cook every meal and we specialize in Thick hand mixed over the top shakes and our number one goal is customer satisfaction. Our portions are generous so no one goes home hungry after a visit to Marv’s. We make sure we use the best produce we can, the highest quality chicken and the highest quality fish. Our fries are freshly made using Kennebec Potatoes for the best taste and highest quality fries in town. We are proud to produce all our food freshly after you order it, that means there is a ten minute wait time, if you are going to be in a rush then by all means call ahead and order your lunch as you are on your way. You still get fresh made hamburgers, but you save yourself some time. We have a drive through window so when you are in a hurry you can still grab a home made burger and fries to eat on the go. If you want to sit down in plesant surroundings and enjoy your meal with friends and family then Marv’s is the place for you. Marv’s features clean and bright surroundings with music from the 1950’s, music that you will enjoy listening to while you eat your freshly home made burgers and shakes. Marv’s is a family business and by having all the family involved we can keep control of the most important things, high quality food and superb service.